For the game and name “pickleball”, we have 3 men, one wife, missing badminton equipment, and a dog to thank! The men are Joel Pritchard, Bill Bell and Barney McCallum. The year was 1965 on beautiful Bainbridge Island in Washington State. One summer Saturday Joel Pritchard and Bill Bell returned home after a golf game to find their children bored at home on the island. On the Pritchard property was an old abandoned badminton court and the men went looking for the equipment to play. They couldn’t find enough rackets for all the players. What they could find were ping-pong paddles and a perforated plastic ball. They placed the net at badminton height, 60 inches, and “volleyed” the ball over it. surface and they lowered the net to 36 inches. The next weekend, Barney McCallum joined in the fun at the Pritchard’s home. Barney had a band saw and created paddles that were a little larger than a ping-pong paddle. The three men came up with the rules to their new game, never losing sight of the original purpose- to create a game the whole family could play and enjoy together. Pickles have nothing to do with the game whatsoever! Joel Pritchard’s wife Joan, started calling the new game “pickleball” because she said, “the combination of different sports reminded me of the pickle boat in crew where oarsmen were chosen from the leftovers of other boats”. The game was named after the Pritchard’s cocker spaniel, Pickles, who chased after the ball and if he caught it, would run away with it. So, the game was named after a ball-snatching dog. Many people claim that both stories are true! At the start of the game’s popularity, no official name had been given to it. The Pritchard’s really did have a dog named Pickles and when the game needed a name, pickleball it was! Whatever you call it, Pickleball is one of the fastest growing sports in the world. You don’t have to play it on an abandoned court meant for another sport. We at Taylor Tennis Courts can build a Pickleball court for you to discover this sport that can be played and enjoyed by your whole family. According to the USA Pickleball Association, USAPA.org, there are over 15,000 indoor and outdoor courts for Pickleball in the United States; and at least one location where you can play Pickleball, in each of the 50 states. Pickleball is being introduced to students in Middle and High Schools in PE classes. There has been an “explosion” of new court construction throughout the United States, especially in the southern states. According to some reports, there are as many as 2.5 million pickleball players in the United States. A pickleball court is the same size as a doubles badminton court and measures 20×44 feet. In pickleball, the same court is used for both singles and doubles. The net height is 36 inches at the sidelines and 34 inches in the middle. The court is striped like a tennis court with right and left service courts and a 7-foot non-volley zone in front of the net (referred to as the “kitchen”). Courts can be constructed specifically for pickleball or they can be converted using existing tennis or badminton courts. Taylor Tennis Courts are experts in the field of sports court construction. 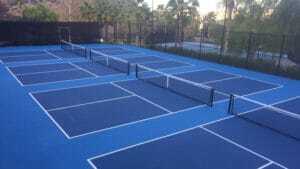 We can build a court to fit your specifications for Pickleball, Basketball, Volleyball or Tennis or any other sport court you desire. If you have a court that needs resurfacing, we can refurbish your old worn out court surface with the latest materials and techniques to restore your sports court to usefulness. Pickleball is the fastest growing sport in the United States. Be a part of it with a Pickleball court by Taylor Tennis Courts.